Not long ago, multitasking was the superpower everyone clamored for. Employees who could conduct a meeting, finalize a report and give feedback on a proposal—all while managing email—rose to the top of the office food chain. But it turns out our workplace hero is actually a villain. Multitasking doesn’t increase productivity, after all, research shows. In fact, it leeches your brain power. Interruptions deluge today’s workers, from the pinging of an email alert to the ringing of a phone. Just using a computer at work ensures a distraction every 10.5 minutes, on average. By the end of the day, all that multitasking can dock our productivity by as much as 40 percent, says the Harvard Business Review. We pay a price for it, too. According to one business research analyst, interruptions cost the American economy an estimated $650 billion a year. Even worse: They lower your IQ. When we think we’re multitasking, we’re actually task switching. That’s because only 2 percent of us are actually physically capable of multitasking effectively. The rest of us can handle only one cognitive function at a time. It’s a core limitation of the powerhouse we call a brain. Task switching ties up several different parts of that powerhouse. One of those is the pre-frontal cortex, which allows to put ideas together and solve problems. When this area of the brain is preoccupied with task switching, our creativity takes a big hit. Unfortunately, the more we switch between tasks, the more we slow our brain’s ability to function—a lot like running a bunch of programs on your computer at once. Even if the actual interruption lasts only 1/10 of a second (deleting emails, for example) we often don’t return to our original task right away. If we’re doing something that requires a lot of brain power, it can take as long as 15 minutes to switch back. Lost time aside, attempting to multitask comes with some lovely side effects. For starters, it can knock 10 points off your IQ—the equivalent of missing a whole night’s sleep. It also stresses us out, frustrates us and causes prospective memory failure, or the inability to remember tasks we need to do in the future. Not exactly the stuff office superheroes are made of, is it? Sadly, avoiding interruptions in the digital age is nigh impossible. But you can minimize them. Concentrated time: The opposite of multitasking, concentrated time means setting aside time for working on just one task. No answering or deleting emails. No surfing the web. Just you, your brain and the task at hand. Batch processing: Cut down on the time you spend managing email by checking your inbox only at certain times of the day. For example, you might answer the priority emails in your inbox first thing in the morning, then scan the trivial emails in your SaneLater folder in the afternoon. The rest of the time, you have permission to ignore that pinging email alert. 80/20 rule: Twenty percent of the work you do drives 80 percent of your impact. Identify the 20 percent of your tasks that are responsible for your effectiveness, and do those—preferably one at a time. It’s no secret that email can be a huge distraction. 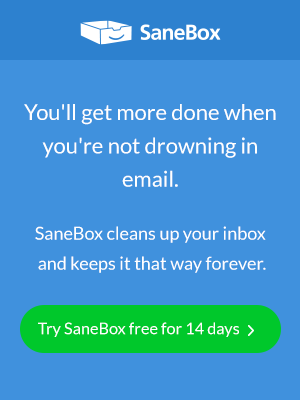 SaneBox keeps you focused by only showing you the emails that matter when they matter. Next Entry You Say You Want an Email Revolution? The Pre Frontal Cortex can be made coherent, according to many EEG studies, by practice of TM (Transcendental Meditation). TM increase blood flow to the PFC and away from the Amygdala, the center of the fight-or-flight response. TM produces a significant drop in metabolic rate, providing rest that is deeper than sleep. I find that meditating regularly dissolves not only the stresses of the day, but deepre-rooted stresses that sleep just can’t remove.